Doctor Who may have celebrated its big five-oh in 2013, but March this year saw its tenth anniversary. Timey-wimey, etc., etc. I mean, of course, the tenth anniversary of Russell T Davies’ modern revival of the series, when the Doctor was introduced to a whole new generation – including myself – via the northern tones of Christopher Eccleston. And while Eccleston may be notoriously reluctant to return to the role, now is a better time than ever for his guilt-ridden Doctor to return in his own comic mini-series. Set between The Doctor Dances and Boom Town, Cavan Scott’s Weapons of Past Destruction sees the Ninth Doctor travelling with Rose Tyler and Captain Jack Harkness, a team that worked brilliantly on screen and yet only spent five episodes together. What we also get here that was largely absent from Eccleston’s telly adventures is an exciting outer space setting; whereas series one’s stories centred around Earth, Scott’s script takes the TARDIS to the far away ruins of planet Excroth. Thing is, Excroth shouldn’t be in ruins yet. Someone’s been mucking around with time, and the Doctor is, understandably, not keen on that. As they investigate, he and his companions come into conflict with two effectively imposing new robotic races – the bulbous Lect and the Unon, who are part-Centaur, part-Centurion. This first chapter is an action adventure that moves along very quickly, so we don’t really get to know any of the supporting characters, but hopefully more backstory will be given to these fellas in future instalments. The leading trio, though, are very well observed, with entertaining dialogue that could easily come from one of 2005’s TV scripts. 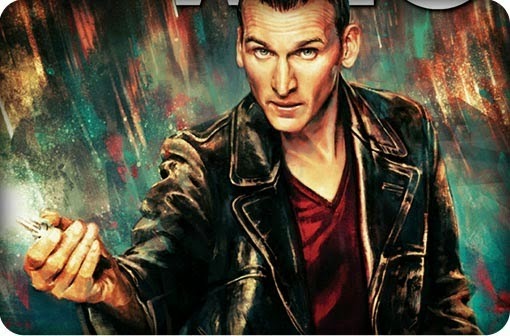 Scott has the underrated Ninth Doctor down to a tee – he’s full of anger, yes, but also full of joy, and is always the first to crack a grin as he stands up for the underdog. Rose pulls the short straw, skirting too close to the traditional companion role of asking the Doctor questions and getting in danger. It’s definitely a comic that does make you want to come back for more, with fun action mixed with hints at a greater mystery to be solved. With only four more instalments in this mini-series, let’s hope it keeps up the quality and is successful enough for Titan to commission more Ninth Doctor adventures, as it’s great to be back on board with Rose, Jack, and my favourite Doctor. They were fantastic and – you know what? – they still are.